Also You Can Follow This Installation Guide on Following Distributions too. Go to TeamViewer Linux Download Page. Then Download the .rpm package under the “RedHat, CentOS, Fedora, SUSE” and save to your Computer. Now Open the Linux terminal and login as root user or you can use the sudo command while executing the commands (For this you need to have sudo privileges). Now we can install .rpm file we download with yum command, when you give the name of the rpm file you have to give the absolute path of the rpm file you Downloaded or In the terminal you have to be inside the directory Where you saved the .rpm File. 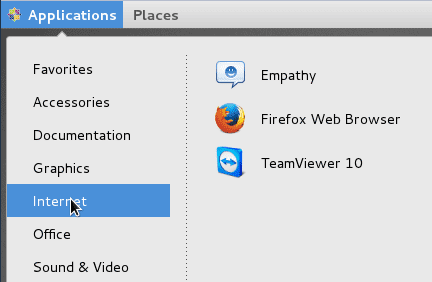 Now you can start Desktop Sharing with TeamViewer. You can even access your Linux Desktop from Windows Computer or Windows machine From CentOS Desktop.